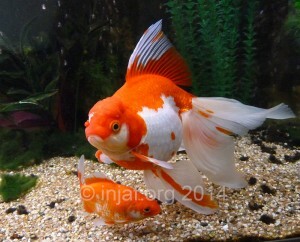 There are plenty of popular ornamental fish species that can grow a lot bigger than many people expect. 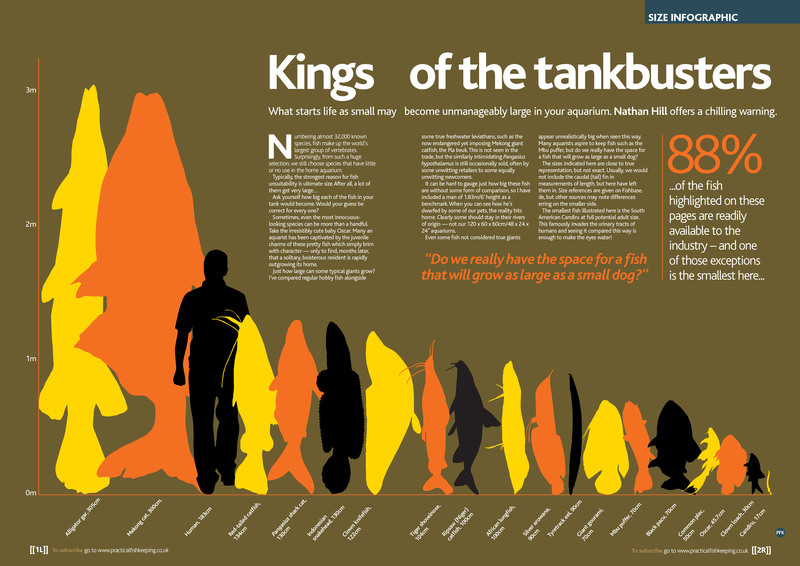 It’s not just the known ‘tankbusters’ that can get large, there are a few minor tankbusters that can easily outgrow a lot of domestic aquariums. 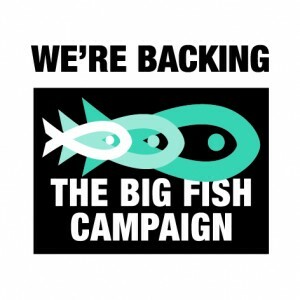 The idea that a fish will ‘grow to the size of the tank’ is widespread, but the size of the tank is not the deciding factor in how large a species may grow. 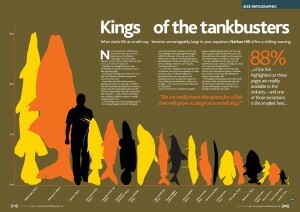 Please see our article on do fish grow to the size of their tank for more details. Most people understand that buying a puppy will soon lead to owning a fully grown dog. No one expects their labrador to stay the size it was at a few weeks old. It doesn’t come as a surprise when the cute little puppy collar no longer fits, and the dinky little bowl for puppy food doesn’t hold enough for a light snack let alone dinner. The same is true for fish, those babies will grow into much bigger adults. Those starter tanks are just that – starter tanks – the aquatic equivalent of puppy collars. Your fish needs a home that will fit it when it’s an adult, it has to live there for the rest of its life. Bowls and starter tanks will not house a fish for long! I well remember seeing some adult guppies at an aquatics show a few years ago. I’d not really seen adult ones before, only the babies in shops. I found myself thinking ‘gosh, they’re bigger than I thought’ swiftly followed by ‘of course they are, they’re adults, the ones in the shops are babies!’. It’s easy to under-estimate the adult sizes of fish species if you’ve never actually seen a fully grown version of that species. 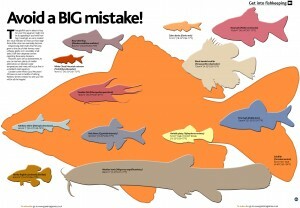 Goldfish are one species whose potential size is often under-estimated. It seems that very few people have seen full grown, 30cm long adult fancies, or even full grown commons. They are one of the most commonly bought ‘stealth tankbusters’ – we refer to them as ‘stealth’ tankbusters because these are the species that many people fail to realise have the potential to outgrow most domestic aquariums. They are not quite in the same league as red tailed catfish but they are no less entitled to be thought of as tankbusters. Goldfish, like many fish, start life as barely visible fry, only a few millimetres long. If a human baby increased in size in the same way it would end up being over 25 metres tall! 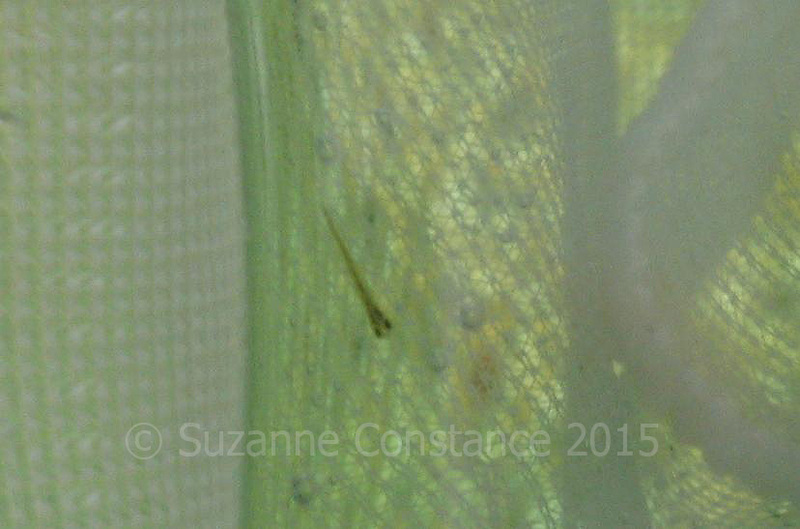 Those barely visible babies soon grow though … the fry pictured above would be smaller than one of Howie’s scales! 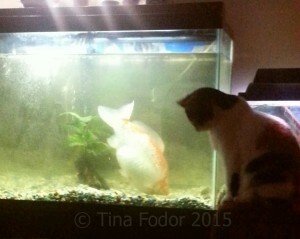 This photo shows Swimmie the goldfish next to a domestic cat – you can see the goldfish is a big chap! 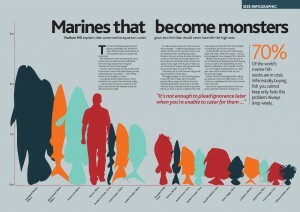 It’s not just the length of the fish that needs to be taken into consideration, some species can also grow very tall. Angelfish are a good example as are certain types of fancy goldfish, as both are capable of growing as tall as they are long. These very tall species need tanks which are suitably deep to enable them to swim around, up and down and have a good range of movement. 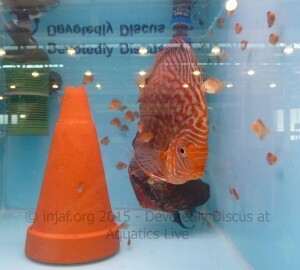 Some species such as angelfish and discus are very narrow compared to their other dimensions, other species can be significantly ‘fatter’ though. These species need a bit of room to manoeuvre, chunky fish won’t turn on a sixpence and they take up more space by virtue of having a large body mass. 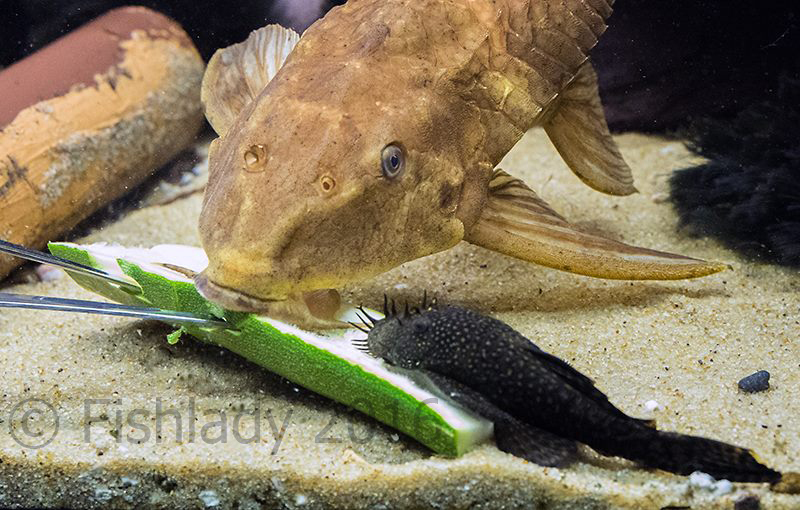 A 30cm common plec is likely to have a smaller body mass than a 30cm common goldfish. Both are bigger species, but the goldfish is likely to be deeper in the body, and probably wider than the plec. Fish start life as either eggs or tiny versions of themselves. Some fish lay eggs, some are live-bearers which means they give birth to live young. Parenting styles vary dramatically between species. Some species, such as goldfish, are not good parents and will eat eggs and fry given the chance. 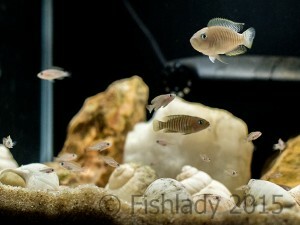 Others, including many cichlid species, are fiercely protective of their young and will fight off much bigger fish. It’s not unknown for a pair in a tank to keep all other residents at one end of the tank and not allow them to get near the babies. 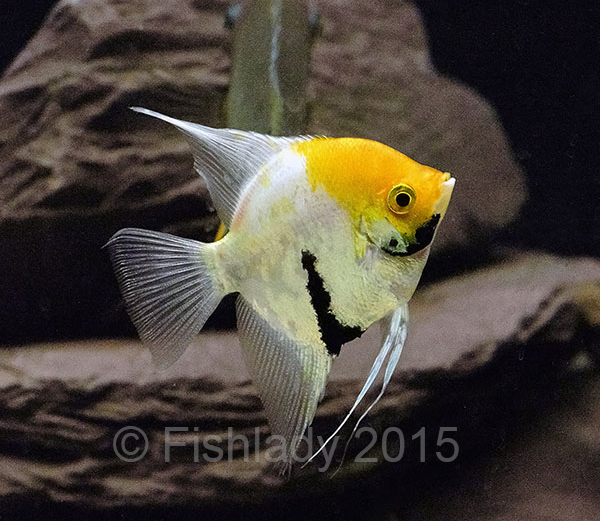 Baby angelfish can be tiny when you first buy them in the shops, sometimes only the size of a coin. 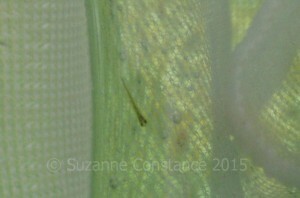 These tiny fish will soon be adults though, and significantly bigger all round. Adult fish can often be almost completely different shapes to the juvenile version. Baby fancy goldfish sometimes look rather unassuming, with short fins and relatively dull colours. The fins develop in length as the fish grows, so you won’t necessarily end up with a bigger version of the baby, you could end up with one that’s developed quite dramatically. 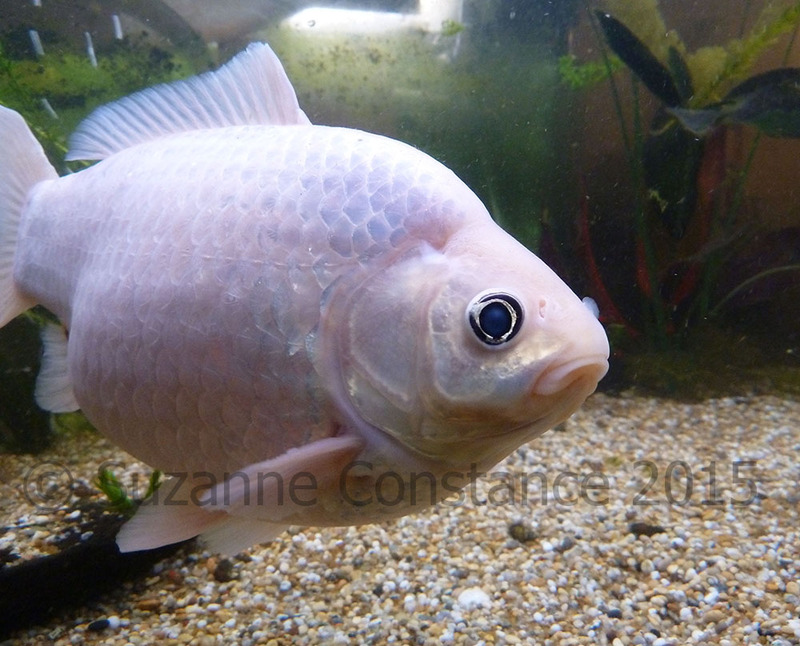 Albie, shown below, is one of my own fish, he was bred by someone else and I adopted him, his mum and brother when he was only a few weeks old. I’ve been able to see first hand how much they can change! Baby fancy goldfish can grow large fins as well as large bodies! Pixie, shown below, was a tiny little fellow when he first arrived as a rehome from a friend. He grew to over 35cm long when in ‘full sail’. It’s not just goldfish of course that change shape and size dramatically as they mature from babies to adults. These Rotkeil severums show the change in size, colour and shape from 5cm juveniles to 15cm adults. These Apistogramma panduro show the tiny babies being looked after by their mum, and how they grow and change to become adults. These Pelvicachromis silviae also care for their babies. The ever popular corydoras family has a huge range of varieties, but they all start life as tiny eggs before developing into miniature corys with weeny little barbels, and then finally reaching adult size. Some fish like to live together in multi-generational colonies, Neolamprologus multifasciatus aka shelldwellers, shellies or multies are a very popular small cichlid who happily live in large groups with many generations. Clown loaches are often sold as tiny fish, only 3cm long or so. 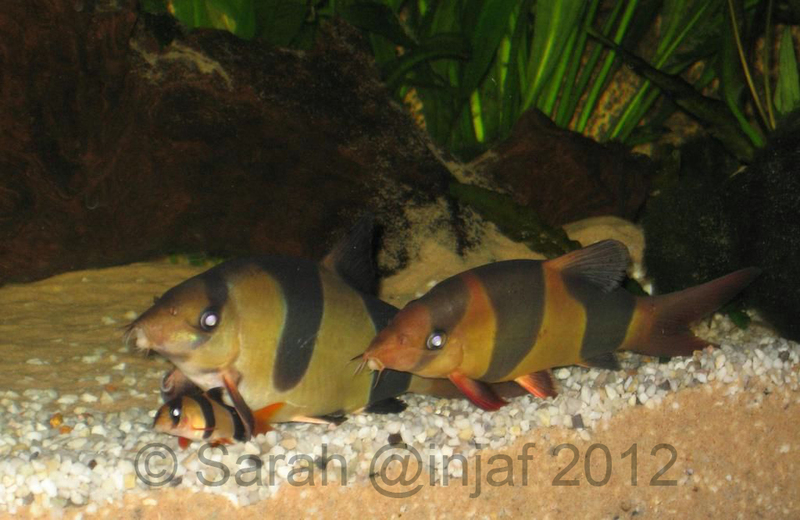 These little babies won’t stay that size for long though, clown loaches can easily reach 30cm or more in length. The little fellow at the front is the size often sold in shops, his companions are on their way to adult size but still have a way to go. 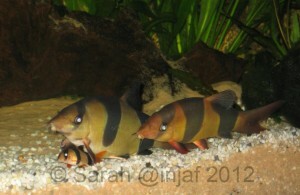 Clown loaches won’t stay small like the little guy at the front for long! Bristlenoses are a popular addition to many tanks, the baby shown here with dad is only a couple of weeks old but will soon be taking after its parents. 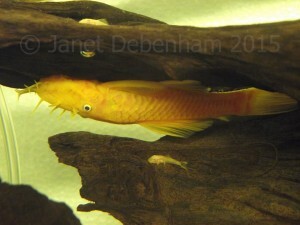 And just to compare the adult size of a Bristlenose to that of another popular ‘sucker fish’ – the one shown below is almost fully grown, he might put on another centimetre or two but he’ll never get close to the size of the fully grown Common Pleco he shares a tank with! The Common Pleco shown here is a 40cm/16″ adult, and the Bristlenose is almost fully grown – you can see how much more of a manageable size the Bristlenose is for the average aquarium. Hermione and Barney demonstrating why Bristlenoses are a much more suitable choice for the average aquarium than Common Plecos. The adult size of any species is something that needs to be taken into account when deciding whether or not you should keep that species. We recommend choosing species that will not outgrow the home you know for sure that you are able to provide for them. Please make sure that you research your chosen species fully, and are able to provide a large enough home for them at their adult size. 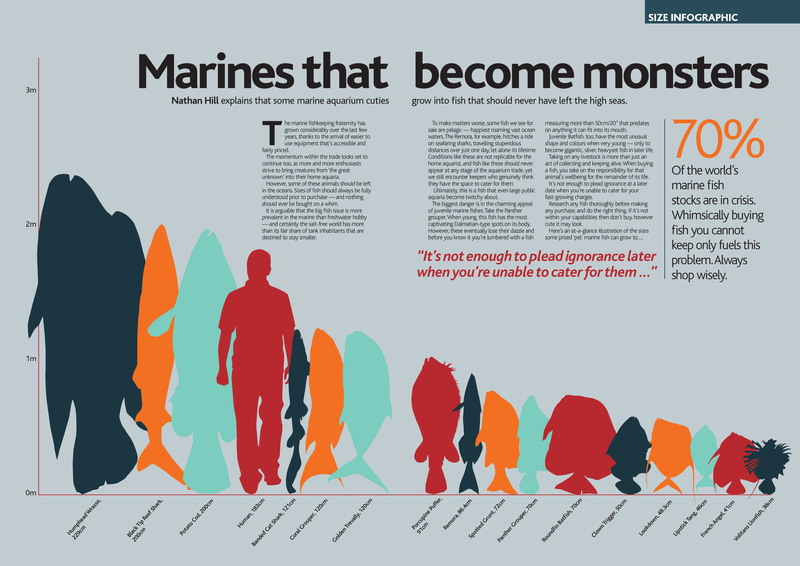 We’ve put together our interactive infographic to help illustrate the expected adult sizes of some of the more popular and readily available ornamental fish species. Hover over the images for more information. 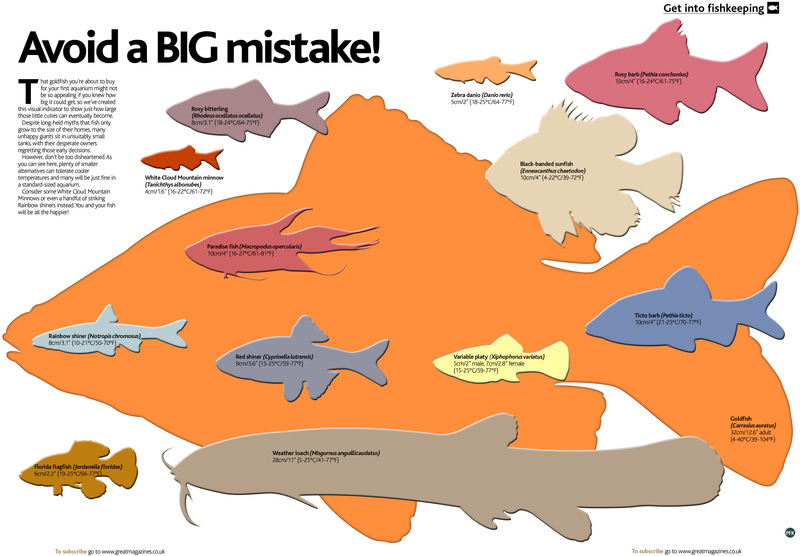 Goldfish are often omitted from these sort of infographics, so we thought it was high time they got their place in the hall of fame! You’ll note they are in the top five. Reproduced with kind permission of Jeremy Gay and Nathan Hill of Practical Fishkeeping Magazine. 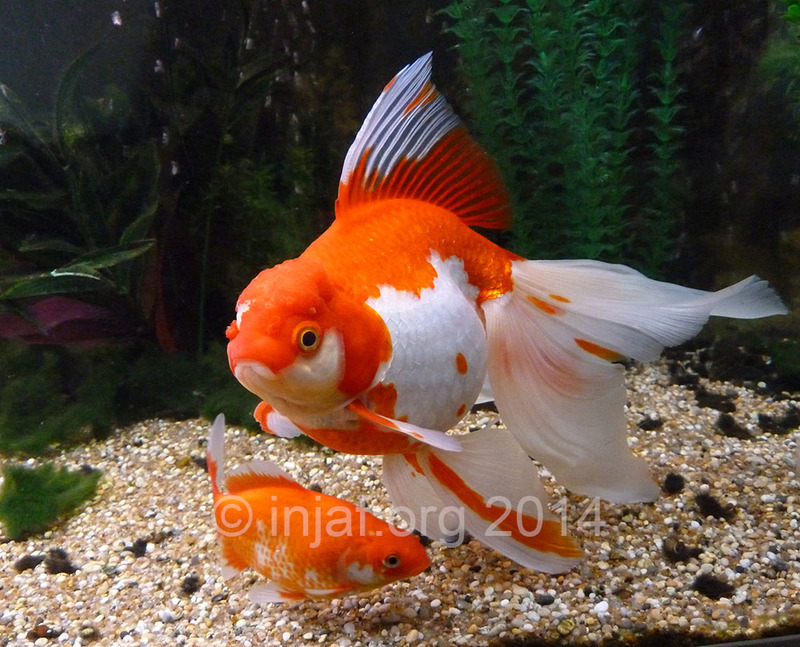 The real adult size of goldfish – Avoid a BIG Mistake!